Each person in your Life is your Teacher! Celebrate the teachers in your Life! Celebrate everyone in your Life! Because, everyone is, in some way or the other, teaching you about Life! The conventional definition of a teacher is one who helps you qualify on the academic side. But what use are the education you receive, and the degrees you accumulate, if you don’t know how to live your Life intelligently? This is where the definition of a teacher merits expansion. There’s the ‘guru’, of course! And that’s not always the one who is the ocher-wearing, bearded sage who mouths mantras. The word ‘guru’ is derived from Sanskrit. In simple terms, ‘gu’ means ignorance and ‘ru’ means the remover or dispeller. So, literally, a ‘guru’ is someone who removes ignorance, the darkness, in you and lets the light of knowledge into you! By this definition, anyone can be a guru. Anyone who removes the veil of ignorance and helps you soak in wisdom of any kind. Even a detractor is a guru. Or someone who lets you down. Because a detractor is teaching you how to face criticism and someone who betrays you is teaching you the value of trust. When you don’t see people as teachers you may tend to miss the learning in each interaction, in each moment. This eventually retards your inner growth. Historically, in India barbers were considered a lowly class. And were looked down upon. Unfortunately, more often than not, they still are. However, in recent times, hairdressing and its practitioners have gained respect and found both professional and social standing. 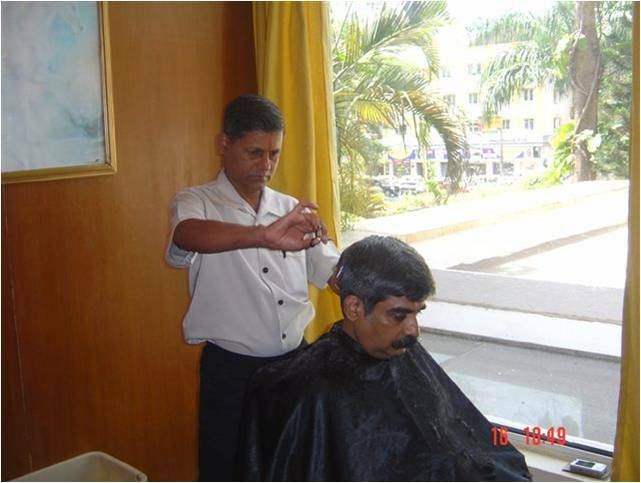 At a time when I had a lot of hair on my head, I would visit the salon at The Taj Residency Hotel in Bengaluru. My favorite hair stylist was a middle-aged man called Ramalingam. He is a simpleton. But very skilled and has a great service attitude. One afternoon, may be 15 years ago, when I showed up at the salon and Ramalingam began working on my hair, I got a call on my phone. It was a colleague who was reporting that a client had not made a payment that was long overdue. I had given specific instructions that we needed to have that payment collected one way or the other. I was naturally upset. Without realizing where I was seated, with little respect to the others around me in the salon, I let off a lot of steam at my colleague. I may even have used a few expletives. When I hung up, I realized that Ramalingam had stopped working on my hair, and was standing some distance away. I presumed he had done so to allow me to finish my call. Impatiently, fuming, I gestured to Ramalingam to get on with it. Ramalingam’s extempore unsolicited sermon touched my soul. I realized my folly. It was the fondest call for awakening from a man least qualified technically for making it!. That afternoon, I believe, Ramalingam was like Krishna and I was his Arjuna. He was__and is__my guru because he dispelled, removed the ignorance in me. He introduced me, in the simplest of ways, to intelligent living! As they often say, “When the student is ready, the teacher shall appear!” Perhaps I really was ready that day! To this day, although I don’t have much hair left on my head, whenever I am in Bengaluru, I do make the pilgrimage to meet Ramalingam. He reminds me that I am still a student of Life, learning from each of Life’s ambassadors who touch my Life in their own special, inspiring ways! Therefore celebrate every single person in your Life. Do not have opinions. Don’t judge people. Each one you know is a teacher. And in their own ways, they are teaching you to love, to trust and to make a difference. Nobody is good or bad. Through people’s kindness you learn to appreciate the goodness and purity in all creations. People who forgive you teach you humility and how to elevate your perspective at times when you don’t need to. People who are unkind and unjust are teaching you patience and forgiveness. Thank everyone you know every single day for making you who you are today! Author AVIS ViswanathanPosted on December 7, 2012 March 14, 2016 Categories Anger, Art of Living, Barber, Gratitude, Guru, Hairdressing, http://schemas.google.com/blogger/2008/kind#post, Humility, Intelligent Living, Student, WisdomLeave a comment on Each person in your Life is your Teacher!